The annual parade saw thousands turn out to welcome Santa. Dec. 2, 2017 8:00 p.m.
Santa’s fans were out in force for this year’s edition of the Magic of Christmas parade in Langley City on Saturday night. Festivities began in McBurney Plaza in the late afternoon, where an ice sculptor crafted a castle of snow and kids took part in arts and crafts. A full choir sang carols to entertain those gathering. The main event began at 6 p.m. as the parade rolled down Fraser Highway from 204th Street to 207th Street. Dancers, mascots, clowns, BMX riders, martial artists, classic cars and fire trucks, cadets, and even the Vancouver Giants zamboni took part in this year’s edition. The weather cooperated too, with the rain ending not long before the festivities began. 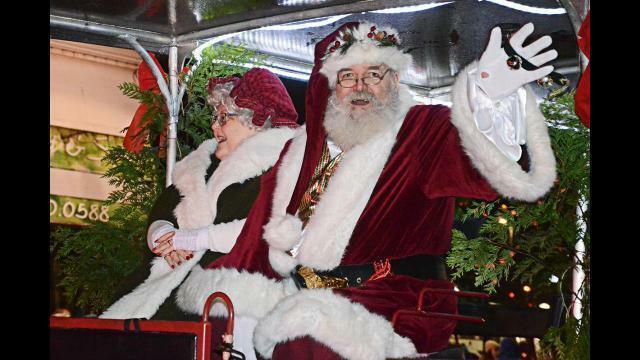 After the parade, Langley City Mayor Ted Schaffer and members of the council welcomed Santa and Mrs. Claus to McBurney Plaza, where the Christmas tree was lit.